What can Amethyst, February’s birth stone do for you this month? This month I’m going to be sharing what there is to know about amethyst and how February’s birth stone can help you. This crystal is great for a number of things, but first let me ask you, how are you sleeping? Do you have trouble in getting off to sleep? Perhaps you drop off quite easily and then wake up in the middle of the night and struggle to get back to sleep. Or is the problem getting to sleep in the first place? It seems that once we hit adulthood, we lose the ability to sleep as we did when we were children, hitting the pillow at night time, and then next thing we know, we’re awake and it’s morning. And then related to sleep are our dreams. Do you dream often, do you remember your dreams? Perhaps you feel that you rarely dream. Are your dreams full of wonderful, interesting stuff, that is out of this world, or can you link your dreams to what is happening to you in your life right now. It is a known fact that we all dream every night, regardless of what or how often we remember them. If we don’t have good sleep, apart from feeling tired, we are grumpy, irritable and can lack concentration. We don’t do our job as well as we do if we’ve had a good night’s sleep. It can affect our decision making and we can make bad choices. Our relationships suffer because we’re working on half empty, we buy things we don’t need to make ourselves feel better and are more likely to make mistakes at work. Added to that, if we are not dreaming because we are not sleeping, that is not good for us either. Our common everyday dreams allow us to sort out what has gone on the previous day and put things into perspective. It also allows us to come up with solutions for anything we needed answers to the previous day. If we don’t sleep and we don’t dream, this can be very damaging to us in the long term. This is where amethyst comes in to help you. Take a small piece of amethyst, a tumblestone is perfect for this, and ask it to work with you to help you with your sleep and your dreams. Then place it underneath your pillow and it will start working with you. Amethyst will help with relaxation. It’s calming and comforting, and you will find you can get to sleep more easily. This is a very magical crystal. Amethyst is a gorgeous crystal ranging in colour from pale lilac right through to the deepest purple, and sometimes with a hint of reddish tones too. The violet purple colour of amethyst comes from ferric iron mixing with silicon dioxide, the main component of this crystal. Radiation within the earth also contributes to this. As amethyst is a member of the quartz family, and as quartz is the most common crystal in the world, amethyst is also found all over the world. The very darkest purple comes from Uruguay, with the very pale, Vera Cruz being found in Mexico. Amethyst from Russia is a more reddish purple. People often talk about energising their crystals in sunlight, and while taking your amethyst crystals outside for brief periods can be very beneficial to them, please be aware that if left in sunlight for too long, their colour will fade, and that strong purple crystals will be a shadow of itself. 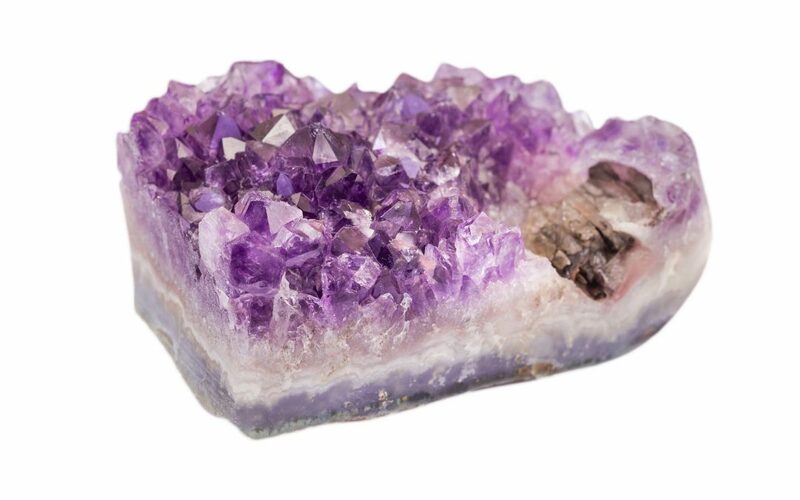 The word amethyst apparently comes from a Greek word meaning not intoxicating. The ancient Greeks believed that amethyst prevented intoxication, and therefore had goblets made from amethyst with the hope that it would prevent drunkenness. Amethyst can help with so many things. 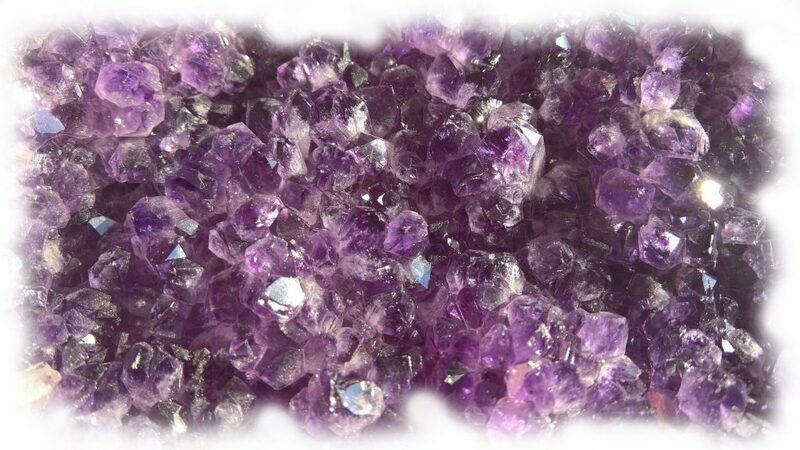 Discover more about amethyst and other crystals. How I can help you with a crystal healing session? By having a crystal healing session, you can enjoy healthy sleep and inspiring dreams. Next month we will look at aquamarine.